The Cherry Creek Farmers Market is considered “tops in the field” out of all farmers’ markets in Denver and in Colorado. In fact, Colorado Biz Magazine says that the Cherry Creek Farmers Market is the “Cadillac of farmers’ markets among nearly 50 markets throughout Colorado.” If you’re looking for fresh flowers in Denver, and the chance to get outside, enjoy the fresh air and meet people while you’re at it, wake up early and shop for flowers and more at the Cherry Creek Farmers Market. The market runs until 1 p.m., so you don’t have to get up at the crack of dawn if you don’t want to. But, you will find that the best bouquets and single-stem floral options sell out quickly. We suggest you go early in the a.m. – when the crowds are lighter and there’s more blossoms to choose from. Visit the Cherry Creek Farmers Market for local delights that you use to liven up your home for no reason other than beauty is a joy. Or, pick out flowers for a formal occasion like a dinner party or reception. 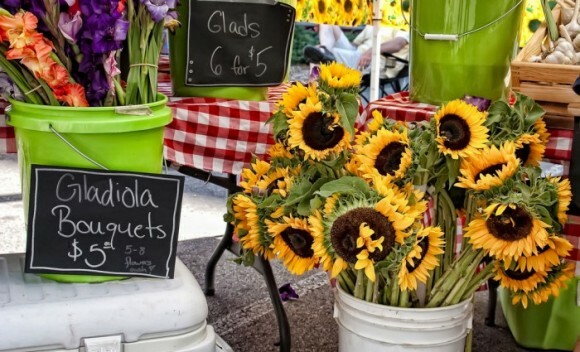 This farmer’s market has many options and they change seasonally, so during summer you’re sure to find some pretty things that you might not have had the chance to score had you visited the market this past spring. And, there are some yummy artisan breads that are great for breakfast, and fresh organic produce to take home with you. So, make a day of shopping for flowers in Denver at the Cherry Creek Farmers Market. as you enjoy Activities in Denver like hiking or biking, and yummy wines from Denver’s top wineries. Wednesday (June 18 through September 24) – 9 a.m. to 1 p.m.
Bring several reusable shopping bags to the Cherry Creek Farmers Market so you can fill them up with all of your lovely flowers and other goodies. The Cherry Creek Farmers Market is a wonderful place to buy fragrant flowers for 4th of July celebrations. The Cherry Creek Farmers Market sells the freshest of flowers and it keeps local families and farmers in Denver profitable. Cherry Creek Farmers’ Market is located at 2500 East 1st Avenue, Denver, CO 80202. Tel: 303.442.1837. The Cherry Creek Farmers Market is considered “tops in the field” out of all farmers' markets in Denver and in Colorado. In fact, Colorado Biz Magazine says that the Cherry Creek Farmers Market is the “Cadillac of farmers’ markets among nearly 50 markets throughout Colorado.” If you’re looking for fresh flowers in Denver, and the chance to get outside, enjoy the fresh air and meet people while you’re at it, wake up early and shop for flowers and more at the Cherry Creek Farmers Market. Fresh Flowers at the Santa Fe Farmers Market DIY Guide to Farmers’ Market Bouquets Coyote Family Farm in the East Bay for CSA Flowers, Produce, and More The National Cherry Blossom Festival is Coming to Washington D.C.